Who would guess that something as wonderful as down slippers was available for our feet. A slipper and foot massage in one. 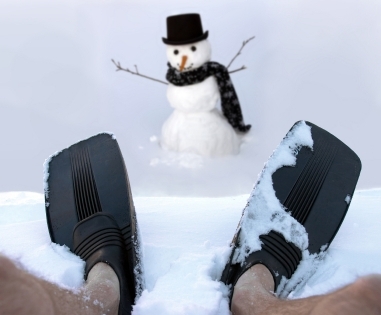 These slippers are the perfect solution for even the coldest feet whether at home or at the chalet. Treat your feet and delight your senses. Down and feather Slippers are available in Women, Men, and Kids Sizes. They come in a shoe style slipper or in a booty style slipper. For a heavenly combination try down memory foam slippers. Slippers filled with down are affordable. With the colder weather at our door step, winter around the corner, and the holidays on the horizon a plush oasis for your feet to enjoy after a long hard day out and about, or just relaxing around the house on the weekends is just what you need. If you or someone you know feels like you're wearing flippers in January, you need slippers made of goose or duck down. Don't forget the kids. You'll never have to worry about their feet being cold with slippers like these! If you are a camper or enjoy time away from home at the cottage or chalet the more rugged foot duvets with a waterproof fabric may better meet your needs. Anyone who suffers from cold feet will tell you that it's impossible to warm up the rest of your body if your feet are cold. Down filled slippers can help. Walking around in your slippers or even just wiggling your toes inside them for a few minutes will have your feet feeling warm and toasty. If you live in a drafty house or you want to make cut back on heating costs your down filled slippers will pay for themselves in Energy Cost Savings. Throw on your down slippers and a sweater and you can turn down your thermostat 2-3o without being cold and save money. Save 3% of heating costs for every degree below 72o that you set your thermostat at. Return from this Down Slippers page to the Down Bedding Delights home page.